It is generally assumed that large, ‘AAA’ video games are only feasible by large development studios. With the rising costs of ‘next-generation’ technology forcing many smaller studios out of business; this dissertation examines the extent to which the “Small and Agile approach” can enable small Independent Game Developers (IGDs) to remain competitive, continue to innovate, and ultimately survive. By using case study and literature review methods, the suitability and effectiveness of the ‘Small and Agile’ approach was evaluated in the context of IGDs in the ‘AAA’ market. This involved critically analysing the application of Agile Manufacturing (AM) to the relatively under researched area of the video games industry. Specifically, three AM frameworks were examined in detail, and their practical application demonstrated with examples from the games industry. The overall impact of this approach was then considered with regard to emerging trends in the industry. First, while the majority of AM literature agrees on the potential benefits of AM, there is little consensus on how to define, implement, and measure it. Secondly, while there is evidence that individual agile practises are being successfully implemented by agile studios in response to turbulent market conditions; the full potential of this model has yet to be harnessed. Third, while the ‘small and agile’ approach can lower overheads and improve organisation flexibility; funding still remains the biggest road block to developing and exploiting original IP. Finally, it was predicted that the recent emergence of game production companies, specialist middleware providers, outsourcing vendors, and digital distribution channels could pave the way for developers to become true ‘agile enterprises’. In conclusion, the research concurs with the findings of the UKTI – natural selection in the games industry will likely result in fewer, but more proficient studios. While there is no guarantee of survival, it is recommended that smaller IGDs maximise their chances of survival by adopting agile production methodologies. Agile Manufacturing; Agile Production; Software Development; Computer / video games industry; Small-medium enterprises. “One result of the Darwinian extinction of developers in the west is that those still standing represent more stable, more efficiently run companies, to which greater publisher and investor interest is being attracted, and for which currently demand outstrips supply. Towards the end of 2007 the UK Trade and Investment (UKTI) released its in-depth ‘Playing For Keeps’ report on the state of the computer games industry in the United Kingdom. With respect to the challenges and barriers faced when creating new games intellectual property (IP), it concluded that the majority of independent game developers (IGDs) would struggle to survive beyond 2010 (UKTI, 2007). It predicted that in the next-generation (AAA) market, the majority of IGDs would work-for-hire, resulting very limited opportunities to develop new IP or gain royalties (UKTI, 2007). Unfortunately, this stark conclusion echoes the sentiments of industry professionals over the last few years. Game production costs have risen dramatically, driven by technological innovation, competition, and rising customer expectations (Schoback, K. 2005; Boyer, B; Nutt, C. 2008; Costikyan, G. 2006; Ford, S. 2006). For example, on the expensive ‘next-generation’ hardware platforms (such as the Microsoft Xbox 360 and Sony Playstation 3) games are estimated to cost between $10-20 million to develop, with total production costs in excess of $60 million per title (Schoback, K. 2005). To break even, publishers typically have to sell-through over 1 million units per title (Schoback, K. 2005; Costikyan, G. 2006;). Likewise, due to the way royalties are calculated, for the developer to see any profit the game has to be a ‘hit’, like Bungie Studios’ Halo 3. As a result, publishers have become more risk averse and consolidation in the games industry has risen dramatically, with notable developers like Maxis, Rare, and BioWare being acquired by large publishers like Electronic Arts (EA) and Microsoft Game Studios (Rogers, D, L. 2004; UKTI, 2007). Indeed, the situation has become so volatile that publishers themselves are at risk, such as Grand Theft Auto publisher Take-Two Interactive (T2) which is currently defending a hostile takeover from EA (Boyer, B., Jenkins, D., 2008). From an artistic perspective, critics have been quick to declare creativity and innovation in games industry as ‘dead’ (Crawford, C., 2006). Derivative ‘copycat’ titles are on the increase, and there is an over reliance on sequels and licensed IP (Crawford, C. 2006; Radar Group, 2008). Worse still, increasing content demands, tight production schedules, and compulsory overtime (development ‘crunches’) have caused some to liken modern games development to “sweatshop” work (Radar Group, 2008; ea_spouse, 2004). It would seem that trying to make creative and fun games just isn’t financially feasible anymore. In response, some IGDs have been quick to take action by reconsidering their studio models and pursuing new opportunities. Digital distribution, for example, has opened up some interesting new avenues for IGDs, allowing them to sell their games directly to their customers. Indeed, companies like Telltale Games have taken this one step further, and designed their games around the digital distribution concept, releasing game ‘episodes’ on a monthly basis (Cifaldi, 2006). Likewise, other studios are pursuing opportunities on less expensive platforms such as casual & mobile games, the Nintendo Wii and DS, and similar. Denki, for example, have enjoyed great success developing games for Interactive Digital Television – a largely untapped market (Jordan, J., 2007). Developers wishing to remain in the next-generation console market are perhaps the most interesting to study. The majority of established developers are following the conventional business wisdom of growth (Muzyka, R, 2002). The logic is sound: bigger games require bigger teams to build them, with successful developers like Valve Corporation, Bungie Studios, and Realtime Worlds all boasting teams of over 150 to 200 staff. However, massive growth on this scale is not an option for start up developers because, as the ‘Playing For Keeps’ report suggests, a stable source of funding is difficult to secure for unproven studios (UKTI, 2007). There is an alternative to growth, however. The ‘Small and Agile’ approach, as coined by Finnish developer Remedy Entertainment, has been promoted as a way for small studios to leverage their intellectual strength, design innovation, and managerial flexibility over raw strength in numbers (Drake; Seppänen, 2007). Indeed, supporters of this model and its variations, suggest that by deliberately remaining small in size enables them to become ‘agile’, and therefore more creatively flexible and innovative (Schoback; Myllyrinne, 2007). Although Remedy themselves are modest in their ambitions, what makes this approach interesting to examine is its audacity and boldness in the face of considerable risk. The notion of remaining ‘small’ directly goes against the conventional business wisdom of growing to survive (Storey, 1994); and while it may have been possible in the past for developers to build an AAA game with less than 30 staff, the general consensus is that it’s simply not possible anymore (Bungie, 2007). Likewise, while the principals of organisational agility and agile manufacturing are gaining momentum in both academic and managerial circles, they are still comparatively new and lack empirical evidence to support their claims (Vázquez-Bustelo, et al. 2007). To what extent will the “Small and Agile” approach ensure the future survival of Independent Developers of innovative ‘AAA’ video games? In an effort to answer this question, this dissertation will look at three core areas. First it will examine the background of the approach, reviewing some of the key literature on the Agile Manufacturing paradigm and its compatibility with the games industry. Next it will consider how IGDs are implementing the agile manufacturing framework, and what benefits, risks, and limitations they’re experiencing with it. Lastly, it will hypothesise the potential impact that this approach (and similar) could have on the games industry as a whole. Institute at Lehigh University (USA) (Vázquez-Bustelo, et al,. 2007). As western industry began to move away from manufacturing and towards the service sector, large firms reported difficulties competing in turbulent, rapidly changing markets. In response to the rising levels of change and uncertainty, the notion of organisation agility was suggested as the possible key to enabling firms to become more flexible and adaptive to fluctuating marketplace conditions (Vázquez-Bustelo, et al,. 2007; Hormozi, 2001; Jin-Hai, et al. 2003). It was suggested that the AM system would ideally enable an organisation to respond in real-time to customer demands (Jin-Hai, et al. 2003), while at the same time maintaining the low costs of previous production systems (Hormozi, 2001). Since then, AM has increasingly gained interest and popularity with academics and managerial consultants alike, some of which are claiming it to be the next major manufacturing paradigm and the key step to achieving ‘world-class’ organisational performance (Vázquez-Bustelo, et al,. 2007; Hormozi, 2001; Jin-Hai, et al. 2003). Some authors prefer to define AM by comparing its principals and performance objectives (i.e. outcomes) with older models. They state that an agile firm should be customer focused; respond rapidly to market opportunities; and produce highly customised products, at minimum cost, in extremely short timeframes (Hormozi, 2001). This is often contrasted with the mechanistic approach of mass-production, rooted in Taylor’s scientific management, which aimed to produce high volume at low cost by breaking down and optimising the individual manufacturing tasks (Duguay, et al, 1997). Although extremely efficient, the assembly line approach left little room for variation or innovation, hence: “Any customer can have a car painted any colour that he wants so long as it is black” (Ford, H., 1922). Likewise, AM is frequently compared to the current manufacturing orthodoxy, lean manufacturing (e.g. Just-in-Time), which aims to maximise value for the customer while simultaneously eliminating ‘waste’ in the production process (thus lowering costs). In practise, this means keeping inventory low, and using the minimum number of resources necessary to deliver the product on time, exactly when it’s needed (Hormozi, 2001). However, at this point the literature is divided on whether AM is an evolution of these past processes, or a revolutionary new production paradigm (Jin-Hai, et-al., 2003). On the one hand, it can be described as an amalgamation of the past processes because it aims for evolutionary ‘fitness’ (Jin-Hai, et al., 2003) by combining the efficiency of lean, the flexibility of flexible manufacturing, at the cost of mass-production (Vázquez-Bustelo, et-al., 2007; Adeleye and Yusuf, 2006). However, there are also some fundamental differences which mark it as revolutionary. For example, while lean is excellent at optimising controllable variables; agile differs on principal by being designed to handle factors which cannot be controlled (Jin-Hai, et al., 2003). Instead of making the best of limited resources, an agile company leverages the power of external resources (e.g. outsourcing and partnerships) (Ross, 1994). Likewise, in comparison to mass-production which focuses on process optimisation and cost reduction; AM is explicitly oriented towards customer satisfaction, product customisation, and process innovation; theoretically making it the ideal model for the service driven, niche markets of the 21st Century (Duguay, et al., 1997). In order to understand how Agile Manufacturing can be applied to the games industry, we need to go further than the vague notions of agility. While the majority of authors are in agreement that AM theoretically provides organisations with superior business performance (through flexibility, responsiveness, customer sensitivity, and so on) (Vázquez-Bustelo, et-al., 2007); how exactly an organisation becomes ‘agile’ requires more thorough explanation. To this end, we will look at three conceptual agile models which will explain some the core principals in more detail. In the age of industry specialisation and a focus on niche markets, it is very difficult for a single company to control the entire value chain of their primary market (i.e. materials, production, and distribution). Arguably, a company which tries to expand into other production areas, or diversify into other markets is likely to lose their strategic focus and organisational manoeuvrability (Ries, A., 1996). For example, after launching the Personal Computer, IBM tried to dominate everything associated with ‘computers’ (hardware, software, marketing, maintenance, support, consulting, etc), which left it vulnerable to companies like Compac, Dell, HP, and Microsoft (Ries, A., 1996). Perhaps a more pertinent example is Infogrames Entertainment SA (IESA), a European games publisher which tried to vertically integrate development, production, and distribution (Infogrames, 2007). This strategy lead IESA on an extensive strategic acquisition campaign, which included the purchase of Ocean, Shiny, GT Interactive, Hasbro, and Atari (Jordan, J. 2007). Unfortunately, in doing so IESA accrued significant debts which outweighed the revenue being made from their games (Jordan, J. 2007). In trying to control the entire value chain, IESA lost its agility by financially encumbering itself with insurmountable debt. In contrast, one of the core concepts of agile manufacturing is the formation of large virtual companies (called an agile enterprise), comprised of strategic partnerships between smaller agile companies (Ross, 1994; Vázquez-Bustelo, et al,. 2007; Hormozi, 2001; Jin-Hai, et al. 2003). This is not the same as an illegal cartel, which employs tactics like price fixing and bid rigging to increase the barriers-to-entry and reduce competition. Rather than one single entity trying to dominate the value chain; an agile enterprise harnesses the expertise of several individual companies to capitalise on an emerging market opportunity which would otherwise be outside of their grasp (Ross, 1994). Once another market opportunity presents itself, the enterprise reconfigures itself, and rapidly mobilises another group of companies to seize it (Ross, 1994). In this fashion, a global network of small, agile companies (as illustrated in figure 1) can compete effectively in markets out of their individual depth, and also enables them to respond more quickly than any one corporation could. Interestingly, strategic partnerships of this kind can even include former rivals, as demonstrated by the alliance between Apple, IBM, and Motorola (AIM); which formed in 1991 to compete against market leader Intel (Maskell, 2001; Hormozi, 2001). The result was the PowerPC architecture, which lasted until 2006 and is still currently used in all three major games consoles (Wii, Xbox360, PS3). While Ross’ (1994) agile enterprise model is useful in illustrating the virtual company aspect of agile manufacturing, it doesn’t explore the other elements in as much detail. Therefore, we must look at two other models. The objective of ‘multiple-winners’ reflects the agile enterprise model above, and highlights the importance of co-operation between companies towards a common goal. Critically, Jin-Hai et al argue that co-operation between organisations should ideally move beyond formal contracts, to a level where mutual benefits and trust between the firms are formed (Jin-Hai, et al., 2003). Integration refers to the integration of management processes, staff knowledge and aptitudes, and technology. In other words, it represents the management and proficiency of the agile company. Jin-Hai et al, (2003) suggest that real agile manufacturing requires an organisation to synthesise sophisticated management techniques, organisational knowledge, and technological innovation. The key to this is in developing the organisation’s core competencies. In other words, this involves developing the company’s speciality and expertise, through organisational learning, continuous training, and research and development (R&D) – which are considered the key ingredients for innovation (Jin-Hai, et al., 2003). Once a company has developed strength in its core competency and its ability to innovate, it can begin to work with other, equally strong and innovative companies, thus forming a virtual company. However, this can only be enabled by Information Technology (IT), since many of these companies will be distributed across the world. Specifically, IT enables companies to share and distribute information in a coherent manner and communicate effectively across continents via the Internet. Internally, IT allows organisations to improve the production process through automation technologies such as computer-aided-design (CAD) and computer-aided-manufacturing (CAM) (Jin-Hai, et al., 2003). These five elements are expressed as the RAM framework pictured in figure 2. 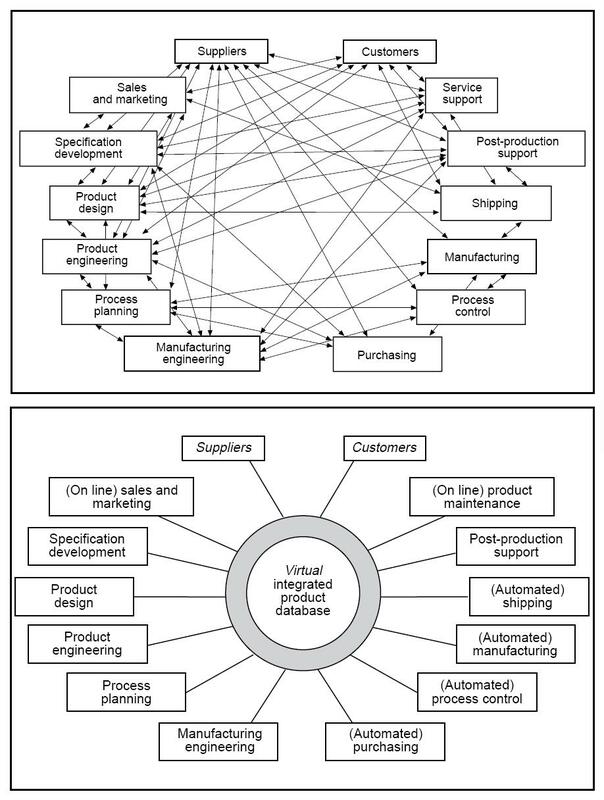 The last model, by Vázquez-Bustelo, et-al., (2007) represents the culmination of Agile Manufacturing literature. Like the RAM model, it represents AM as a holistic production process – meaning that the overall process is greater than the sum of its parts. For example, a game development studio might utilise an ‘agile development’ methodology such as Scrum or Extreme Programming (XP). However, this in itself would not make the studio ‘agile’; just as using outsourcing wouldn’t either. According to Vázquez-Bustelo, et-al. (2007) a company can only attain agility through a strategic co-ordination of these practises, as well as by making simultaneous improvements on all fronts (costs, quality, time, etc). Therefore, the conceptual model presented in figure 3 is an attempt to clearly define AM in terms of drivers, enablers (or practises), and expected outcomes. Figure 3. 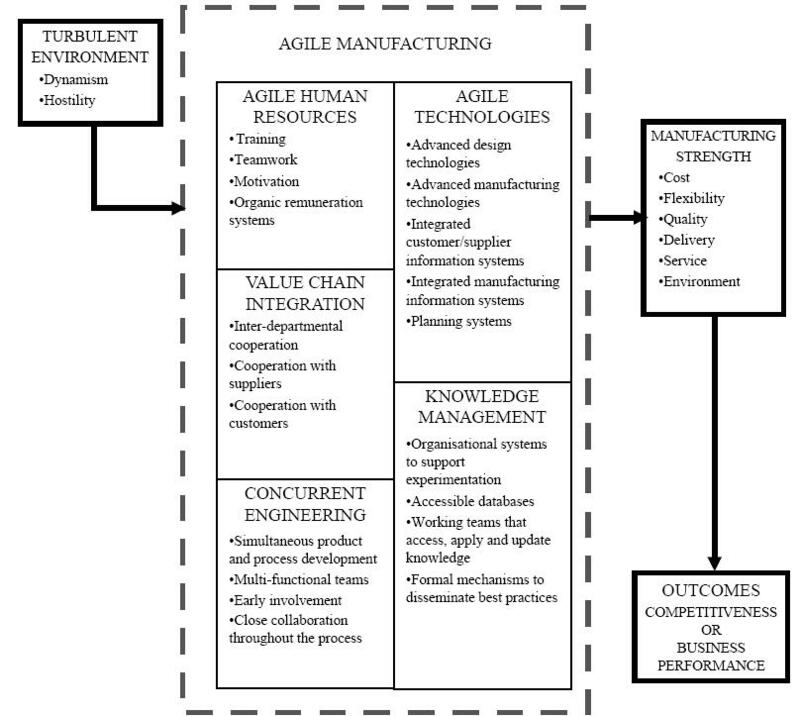 Agile manufacturing conceptual model (Vázquez-Bustelo, et-al., 2007). Perhaps unsurprisingly, the key driver behind companies adopting the AM philosophy is turbulent marketplace conditions. In particular, the majority of AM literature suggests that high levels of competition and dynamism are the most significant drivers; characterised by high levels of hostility, unpredictability, and marketplace uncertainty (Ross, 1994; Vázquez-Bustelo, et al,. 2007; Hormozi, 2001; Jin-Hai, et al. 2003). Survival in these rapidly changing conditions is extremely testing for companies, hence the need for a system which not only manages risk and uncertainty, but embraces it (Hormozi, 2001). Agile enablers deal with the specific organisational practises which define Agile Manufacturing. While there are too many to list individually, they broadly fall into the five categories featured in figure 3. Agile human resources, refers to the management of an agile firm, and generally leans towards a ‘soft’ HRM approach. In fostering agility, almost all of the literature prescribes flat, non-hierarchical management systems; with a strong emphasis on self-managed / cross-functional teams, and minimal bureaucracy. Likewise, continuous learning and training is again recommended, along with strong leadership and open communication. Combined, the goal of these practises is to develop and empowered and motivated workforce (Vázquez-Bustelo, et-al., 2007). Knowledge Management refers to the concept of organisational learning, and making it accessible to the organisation and partners. This can include practises such as evaluating of best practises (e.g. project post-mortems) and storing information on a central database, so that up-to-date documentation is readily available to team members and any external partners that require it. Value chain integration again refers to the co-operation between external firms and the formation of virtual companies, as well as internal inter-department co-operation. Concurrent engineering refers to practises which lead to design and development sophistication and excellence (in terms of speed, quality, and cost). Lastly, as in the RAM model, the strategic usage of Agile Technologies (e.g. IT, the Internet, and automation) is considered a critical enabler in the AM model for design, production, communication, and organisation ( Vázquez-Bustelo, et-al., 2007; Jin-Hai, et al., 2003). The outputs of the agile manufacturing model are, as expected, related to cost reduction, product quality/customisation, delivery speed, customer satisfaction, and increased organisational flexibility. It is suggested that by implementing agile practises, simultaneous improvements on these fronts should occur, which in turn should lead to increased business performance and competitive advantage in extremely difficult market conditions ( Vázquez-Bustelo, et-al., 2007). Clearly, Agile Manufacturing is in its infancy, and further research into the field is ongoing. Unfortunately however, the empirical evidence to support the agile models is still somewhat lacking. The research into Spanish agile firms by Vázquez-Bustelo, et-al., (2007) does confirm a positive link between the integration of agile practises and improved business performance, however it’s uncertain whether this is an isolated case or not. Additionally, it is unclear which combinations of agile practises are the most effective and in which contexts. For example, is agile manufacturing only appropriate for certain industries? Also, does the ‘virtual company’ concept really work in practise? However, at this stage, it is time to turn our attention back to the video games industry. So far we have only explored the theoretical principals of AM in isolation. The next part of this dissertation will consider how AM can potentially help small independent game developers in the turbulent AAA games market, and examine some of the experiences and limitations of agile production methodologies reported by developers. When applying the agile framework to the games industry it should already be apparent that the first condition, agility drivers, has already been met. Competition, rising production costs and the onset of technology (especially transition between game console lifecycles) has lead to an extremely unforgiving market (UKTI, 2007). However, the problem is not simply rising production costs and competition, but the way in which developers earn revenue and overages. Indeed, for the majority of developers, while they might fund and develop the game themselves, it is unlikely they will make a significant profit unless their game performs exceptionally well (UKTI, 2007). The reason for this is quite straightforward. When a publisher signs a game with a studio, it effectively loans them the rest of money required to fund the game’s development (Miller, 2003; Charne, J. 2003; UKTI, 2007). Normally, these advances are paid in regular intervals in return for visible progress of development (called milestones). In addition, the developer will negotiate with the publisher for royalties, typically a percentage of the game’s net receipts (UKTI, 2007). Royalties can be as low as 10% or, in very unusual cases, as high as 70%; depending on how much risk the developer assumes upfront on behalf of the publisher (Miller, 2003; Charne, J. 2003; UKTI, 2007). For example, if a developer has a good track record (i.e. a portfolio of successful games) and agrees to self-fund development, then they are more likely to receive a higher royalty percentage. Currently under 20% is considered average, with few but the highest profile developers receiving over 50% (Miller, 2003; UKTI, 2007). In addition, it also common for the publisher to demand full ownership of the game’s IP rights for sequels and spin offs. The reason developers are unable to make a profit with this model is because, as previously stressed, advanced payments from the publisher work like a loan, and are ‘recouped’ from the developer’s royalty stream once the game is released (Miller, 2003; Charne, J. 2003; Gilbert, 2004; UKTI, 2007). It could be compared to a mortgage – the publisher agrees to assume the risk during development, but expects to be paid back in full afterwards. In practise, what this means is that the developer will not receive any overages until the cost of development has been fully recovered from earned royalties. As a result the publisher will begin earning profit long before the developer does (Miller, 2003; Charne, J. 2003; Gilbert, 2004; UKTI, 2007). Since average game sales have remained consistent over the years, the net result of rising production costs is that many independent developers are now operating at the break-even point (UKTI, 2007). As Electronic Arts CEO, John Riccitiello, puts it: “create a hit or else.” (Nutt, Boyer, 2008) Consequently, many developers are being pushed into work-for-hire models or working on cheaper platforms. While these currently offer a reliable source of revenue, the result of being pushed down the value chain is that the independent developer has little flexibility to “build value” within its company (UKTI, 2007). Given these difficult constraints, the question therefore, is how can an agile framework lower production costs while simultaneously building value in the company? At the studio level, lowering production costs while improving the flexibility of the team is paramount. With reference to the agile conceptual model (figure 3, page 10), we will look at specific agile practises being utilised by developers in the games industry. In addition, we will also divide them into two categories, primary and secondary enablers. Primary enablers cover the two fundamental concepts of the ‘small and agile’ approach – value-chain integration and agile human resources; while secondary enablers cover a multitude of practises which work in combination to support studio agility. Perhaps the most obvious step towards studio agility in the games industry is by working with third-parties to lower overall development costs. By contracting an outsourcing vendor to create art assets for the game (e.g. 3d models like characters, weapons, scenery), the studio does not have to hire large number of full-time artists for the project (Seropian, 2006; Pelit Magazine, 2006). Indeed, the rising trend in outsourcing means that almost every area of development can be contracted out, including art, audio, programming, testing, and localisation. Likewise, in recent years several middleware companies have been established to provide key services to developers. Physics specialist Havok, for example, has provided its world-class physics and animation solutions to over 70 clients, negating the need for developers to waste production time and funds on developing their own physics modules (Drake. S., 2007). Following the success of Havok, similar companies are emerging with their own game production solutions. For example, NaturalMotion’s ‘euphoria’ combines artificial intelligence, biomechanics, and physics to procedurally generate animation ‘on-the-fly’, reducing the need for animators and motion capture (NaturalMotion, 2008). Not only does this technology reduce the need for excess artists; it also improves the quality and variation of the game experience. Animation and physics tools aren’t the only middleware options available. Entire game engines, such as Epic Games’ popular Unreal Technology 3 (2007), can be licensed out by a development studio, potentially cutting several years off the development time. There are some limitations with this approach, however. To make the most out of outsourcing, a significant amount of time has to be invested during the initial selection process to ensure that the vendor can consistently deliver high quality work, on time and to specification (Diamante 2006; Drake, 2007). With middleware, the developers have to make sure that the software they’re licensing is appropriate for the game they’re trying to make; otherwise time can be wasted trying to reprogram the code to do something it wasn’t designed for (Spector, 2000). Additionally, when working with companies across the globe, management and communication procedures need to be in place to prevent cultural, language, and time-zone differences causing production bottlenecks (Meltzer, 2006). At the heart of the ‘small and agile’ approach is the core team (Meltzer, 2006; Drake, 2007; Seropian, 2006). IGDs including Wideload Games; Remedy Entertainment; 3D Realms; and Hothead Games; all advocate maintaining a small team1 of highly motivated and experienced staff (Drake, 2007; Seropian, 2006; Wallis, 2007). In addition to reduced overheads, by contracting out non-gameplay critical work, the team is able to focus on the design and innovation aspects of development (Drake, 2007). “In this industry you’re not going to go far with average developers working on average games. We know that exceptional games are made by exceptional developers and we do everything we can to both attract and keep happy the best developers in the business.” (3D Realms, 2008). Furthermore, the bureaucratic, top-down, hierarchical management structures of large studios are replaced with flatter management systems (Drake, 2007). There are a variety of approaches, but they all tend to use more flexible production methodologies such as Scrum to encourage self-managing / cross-functional teams. Moreover, by breaking down these management barriers, communication channels are greatly simplified. This is characterised by the idea that the entire team can fit in a room, and a have conversation about the game (Drake, 2007; Seropian, 2006). Remedy’s executive producer, Lasse Seppänen, reports that this approach enables everyone on the team to contribute during meetings and thereby ‘reach a consensus’ on where the game is going (Drake, 2007). This enables smaller teams to retain a unified vision, giving them the flexibility and creative freedom to drive the direction of the game. This can be compared to the problems encountered by more fragmented teams, such as the one reported by Warren Spector during the development of Ion Storm’s Deus Ex (Spector, 2000). According to Spector, he mistakenly attempted to create two design teams, based on the logic that some inter-team competition would motivate them and create “an interesting synthesis of ideas” (Spector, 2000). However, the small and agile team approach is not without challenges. One of the key problems with the lean production methods of the past is understaffing, which can lead to frail, almost “anorexic” companies (Ross, 1994). Even with extensive use of outsourcing and middleware, the studio will find itself stretched to its limits. Wideload Games, for instance, did not anticipate the extent of management and co-operation required to work with outsourcing, resulting in many of their artists being distracted from their ‘core’ work (Seropian, 2006). Furthermore, spreading staff resources too thinly can put the studio in a dangerous position, since the sudden, unexpected loss of key personnel could potentially cripple a project (Brian Upton, 2000). Since unforeseen risks cannot be eliminated entirely, it is up to the studio to be prepared to adapt and accommodate them. This is largely why small and agile studios put such significant emphasis on recruiting highly motivated staff; continual learning; and self-managing, cross-functional teams. To become truly agile, a studio must not only leverage its intellectual power, but its technological and organisational sophistication as well. On the development side, we have already explored how licensing state-of-the-art design technology (such as Havok Physics, and NaturalMotion euphoria) can ease the burden of developing a ‘next-generation’ game. Video game design, along with Computer-generated imagery (CGI), is generally seen at the forefront of computer technology, and therefore it stands to reason that developers should exploit the latest technological developments, where appropriate (Jin-Hai, et al, 2003). However, this procedural/CAD technology has to be used with some degree of caution – not only is it expensive, but it’s rarely a substitute for talented people. Even proven technology like motion capture, for example, requires the expertise and direction of experienced animators (Kines, 2000). At an organisational level, Internet and networking technologies enable the studio to vastly improve internal and external communication channels and production pipelines. For example, tools such as wikis, instant messengers, forums, and telecommunications technology can be used to communicate instantly with development partners across the world (Seropian, 2006). Organisational knowledge (research & development, best practises, post-mortems, etc); the game database; and design documentation can be stored in a centralised location (such as private network server), making it readily accessible to the team and trusted partners. This is quite similar to the CALS system implemented by the US Department of Defence in the mid-1980s to cope with complicated data exchanges between departments (demonstrated in figure 4, page 18), which had previously resulted in out-of-date and duplicate data (Ross, 1994). More innovative examples of technological and organisational agility include Hothead Games’ “everything on wheels” philosophy, in which the entire team works on laptops connected together via a wireless network (Wallis, A., 2007). Remarkably, this approach enables the team to rapidly reorganise itself in minutes (e.g. deconstructing and forming new teams); and cope with unexpected problems, such as fires and power failures (the team were able to work on the laptops battery power until an alternative power source was found) (Wallis, A., 2007). In many ways, this kind of flexibility through ingenuity and technology is the epitome of agile manufacturing. By adopting the above practises, and production methodologies such as ‘agile development’ (i.e. Scrum, Extreme Programming, Iterative prototyping, etc), studios can move closer to a concurrent engineering model. That is, rather than developing the game in a linear manner, as prescribed by the traditional ‘waterfall’ software development lifecycle model; developers can “work on all fronts simultaneously, and do it all iteratively” (Seppänen, Drake, 2007). This iterative approach gives teams like Remedy’s the flexibility to fuse research and development (R&D) with the game production process. As Jin-Hai, et al. (2003) notes, learning through R&D is critical for studios to innovate and develop their core competences. This point is best illustrated by the sale of the Max Payne IP rights in 2002. Between them, Remedy and 3D Realms sold the property to Grand Theft Auto publisher Take-Two Interactive for over $45-70 million USD (Miller, 2003; Radar, 2008). Using this money, Remedy were able to self-fund the early stages of their next game IP, Alan Wake; thereby giving them a strong negotiating position when the time came to sign with a publisher (Remedy Entertainment, 2005). However, the problem here is that to reap the benefits of owning IP, developers will have to assume more of the development risk upfront – in other words fund most of the game themselves. Unfortunately, for most developers this is not currently possible, since many have difficulty funding the proof-of-concept demos required by publishers, let alone a full game (UKTI, 2007). Fortunately, a number of recent developments in the games industry could ease the burden on independent developers somewhat. 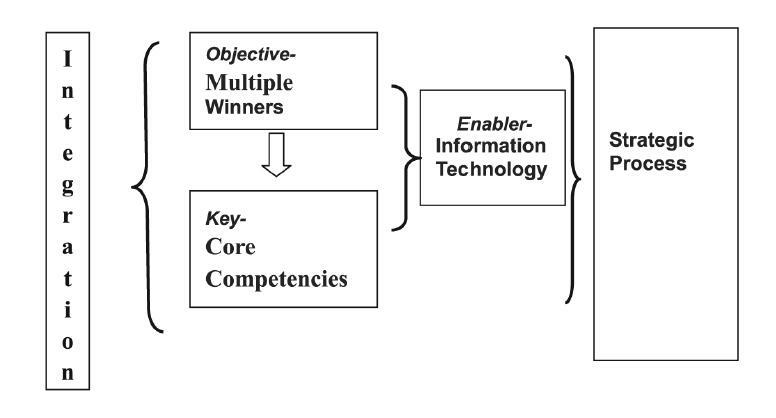 With reference to the agile enterprise / virtual company model (page 7 figure 1), we shall return to the concept of ‘multiple winners’ (Jin-Hai, et al., 2003) presented in the RAM framework (page 9, figure 2). For ‘real’ agile manufacturing to occur, the company must go beyond simply contracting third-parties and licensing technology; and form deeper, more strategic relationships with other companies in the value chain (including publishers and potential competitors). In particular, two services have recently emerged to help facilitate this – digital distribution and production partners. As broadband adoption rates continue to grow, the notion of digital distribution has become more viable (UKTI, 2007). Rather than selling games through traditional retail outlets like Wal-Mart, Gamestop, and GAME; developers can sell their games directly to their customers via the Internet, using services such as Valve Corporation’s Steam, Microsoft’s Xbox Live Marketplace, Nintendo’s WiiWare, and EA’s Store (formally ‘EA Link’). Theoretically, the independent developer stands to receive a much greater share of the revenue using this model, since the role of the publisher is reduced (more so if the developer self-publishes) (UKTI, 2007). With over 15 million registered Steam accounts (Valve, 2008), this approach certainly could be lucrative to the independent developer. However, while digital distribution is certainly growing, it has yet to take off in the mainstream. According to the UKTI, the overall market share for 2006 represented 0.3% of global games software revenues, compared to the traditional retail industry which was reported to be 72% (UKTI, 2007). Additionally, some developers have expressed a reluctance to work with potential competitors (i.e. Valve), and allowing them access to competitive data, such as sales figures (McMaster, 2006). The recent formation of the Radar Group in March 2008 could be a more promising route for independent developers. 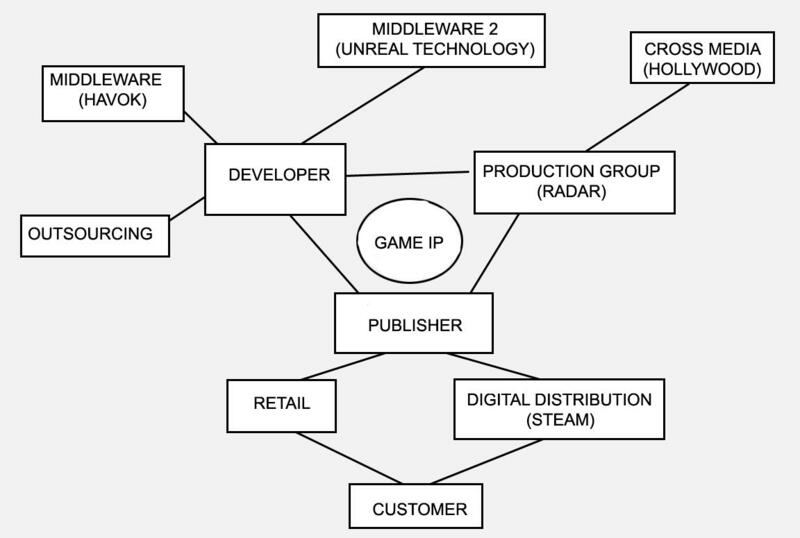 The Radar Group describe themselves as a dedicated production service, focused on creating and incubating original game IP alongside independent developers (Nutt, C. 2008). Formed by ‘veterans’ in games development; games publishing; and Hollywood; they propose to act as a ‘bridge’ between developers, publishers, and ‘cross media’ (e.g. film, television, comics, etc) (Radar, 2008; Miller 2008; Roper, C. 2008,). In return for co-ownership of the IP, Radar offer to fund the early stages of development (pre-production) and co-design the IP from the ground up (Nutt, C. 2008; Radar, 2008; Miller 2008; Roper, C. 2008,). In doing so, they give developers the opportunity to present a stronger, more commercially viable game IP to publishers; thereby enabling them to negotiate better deals and retain co-ownership of the IP. Furthermore, this approach substantially lowers the risk for publishers, while giving them the opportunity to invest in a game that has strong commercial potential (Nutt, C. 2008; Radar, 2008; Miller 2008; Roper, C. 2008,). Lastly, Radar propose to use their Hollywood connections and game development experience to create original IP which is more compatible for both media. A certain degree of scepticism is warranted: – another ‘middleman’ entering the value chain is unlikely to be welcome by either developer or publisher. However, considering that production costs and publisher risk aversion are likely to increase further by 2010 (UKTI, 2007); it may not be possible for the majority of independent developers to create original game IP by themselves. Furthermore, the founders of Radar argue that they have already demonstrated the potential of this ‘multiple-winners’ model, through 3D Realms’ previous collaborations with other developers (e.g. Remedy Entertainment with Max Payne; Human Head Studios with Prey; and id Software with Wolfenstein 3D) (Nutt, C. 2008; Radar, 2008; Miller 2008; Roper, C. 2008,). Interestingly, they explain that the strength of this model comes from the formation of building strong partnerships and trust between organisations, allowing them to “focus on what they are best at” (Nutt, C. 2008). From the agile manufacturing perspective, what is essentially being proposed here is that these companies co-operate with each other to leverage their core competencies (i.e. development, production, publishing, and distribution), in a manner that mutually benefits all (i.e. successful AAA game; shared IP ownership; film and media potential). Figure 5 illustrates how this could lead to a direct implementation of the ‘agile enterprise’ model for the games industry. Notice that the benefits of the original game IP are equally shared between the publisher, developer, and production partner (i.e. multiple-winners). Additionally, each of these core organisations forms partnerships with external specialists to exploit the core-competencies outside of their expertise. Granted this is an idealised representation, however for Real Agile Manufacturing to occur in the games industry, this seems like the most viable route. Figure 5. A possible implementation of the multiple-winners / agile enterprise framework, for the games industry. Undoubtedly, the video games industry is at a crossroads. A generalised interpretation of Moore’s Law would suggest that the production costs of video games will rise in direct proportion to innovations in computer technology (Moore, 1965; Schoback, 2005). Some of the dramatic changes in recent years, such as the rise of consolidation and the move towards cheaper development platforms (UKTI, 2007), could indicate that the games industry has reached the cut-off point where the cost of developing games has become greater than the possible revenue that can be earned from them (i.e. the law of diminishing returns) (Schoback, 2005). Given the intense competition between publishers and the relative short-term lifecycle of games consoles (less than 5 years on average); it would seem that the survival prospects for the traditional independent developer are rapidly decreasing. While opportunities do exist for small independent developers, the UKIT (2007) predicts that by 2010 the majority will find themselves either turning to work-for-hire contracts or moving to smaller markets in order to sustain their business. Furthermore, it seems unlikely that the ‘broken’ commercial models used by publishers to recoup expenses will significantly change in the favour of developers (UKIT, 2007). In all fairness and given the available research, the current answer is ‘it depends’. Certainly there is evidence that the games industry is being driven towards the agile manufacturing model – clearly in response to a difficult operating environment some IGDs are rethinking their internal structures and practises; hiring ‘veteran’ staff in favour of growing; focusing on their core-competences; and embracing new services such as outsourcing, middleware, and digital distribution. These all seem to contribute to lower operating costs, increased studio flexibility, and a highly motivated, well-managed workforce (Drake, 2007; Seropian 2006; Wallis 2007). However, there are still some major hurdles facing developers. Securing development funding, in particular, seems to be the largest barrier to overcome (UKTI, 2007). Publishers have become increasingly risk averse (especially concerning new IP), and this is not likely to change. The ‘small and agile’ approach attempts to resolve this by keeping the staff number at a reasonable level, thus reducing the overall studio overhead. With lower operating costs, the studio has more time and flexibility to innovate and create a stronger game concept. However, this approach requires a significant investment in outsourcing – a sub–industry which is maturing, but requires careful management to run smoothly. Ultimately, when weighing up all these factors, it does not seem likely that just being a small, efficiently run game development studio is enough to secure the most equitable publishing contracts. For a developer to secure a profitable royalty percentage and retain the IP rights to their games they must be prepared to self-fund part or all of development up front (Miller, 2003; UKTI, 2007). However in order to do this, they must have already shipped several commercially successful games, thus putting many studios in a ‘Catch-22’ (situation UKTI, 2007). For established studios like Remedy Entertainment, this isn’t a problem; but for most IGDs (especially start-ups) the prospect of self-funding games is not a viable option (UKTI, 2007). However, it is worth remembering that Agile Manufacturing is a holistic model (Vázquez-Bustelo, et al. 2007). To be successful, organisations have to fully embrace the entire model, not just the aspects that are appealing (such as agile development and outsourcing). This means taking advantage of the agile enterprise / virtual company approach, and actively setting up strategic partnerships with other agile organisations (Ross, 1994). While the claims of ‘Games Industry 2.0’ hint at overconfidence, the Radar Group certainly offers a unique opportunity for independent developers willing to take the risk. It should be interesting to monitor the performance of Radar’s early projects – such as the collaboration with start-up developer Recoil Games. In the long run, should these projects be successful, it seems likely that other production companies will emerge with similar business model, possibly making it easy for developers to secure funding for games. Whether the ‘small and agile’ approach becomes a widespread movement, ultimately depends on these kind of success stories to endorse it. Unfortunately, as it stands there isn’t enough empirical evidence from the games industry to confirm whether or not the approach, as a whole, is as effective as the AM literature suggests. Certainly studios like Remedy, Human Head, and Wideload Games have been initially successful with this approach; but the full potential of Agile Manufacturing has yet to be demonstrated within the games industry. Until these groups begin to consistently release successful AAA games, it will be difficult to measure the success and effectiveness of this approach conclusively. However, what can be said is that new opportunities in the games industry are emerging rapidly. These include technological innovations; platform proliferation; digital distribution; and newer funding models. With this in mind, it seems likely that for IGDs to survive in the long-run, they will not only have to respond quickly to changes in the environment; but they will have to embrace and exploit them before someone else does. Moreover, should game production costs continue to rise even further over the next ten years; then it seems very unlikely that even the largest studios will be able profit from the traditional studio model for much longer. If this is the case, then ultimately, all studios will have to evolve to a new model sooner or later. Natural selection in the games industry will therefore shift slowly away from large, inflexible studios; and will arguably favour smaller, more agile ones. performance outcomes, International Journal of Agile Systems and Management, 1 (1), pp. 93-110. Maskell, B. 2001. The age of agile manufacturing. Supply Chain Management: An International Journal, 6 (1), pp. 5-11. An International Journal, 6 (1), pp. 5-11. McAdam, R., McConvery, T. 2004. Barriers to innovation within small firms in a peripheral location. International Journal of Entrepreneurial Behaviour & Research. 10 (3), pp. 206-221. Ramesh, G., Vidyapeetham, A.V., Devadasan, S.R. 2007. Literature review on the agile manufacturing criteria. Journal of Manufacturing Technology Management. 18 (2), pp. 182-201. Robertson, M, Landry, Jones, C. 1999. Application of lean production and agile manufacturing concepts in a telecommunications environment. International Journal of Agile Management Systems. 1 (1), pp. 14-16. Vokurka, J., Fliedner, G. 1998. The journey toward agility. Industrial Management & Data Systems. 98 (4), pp. 165–171. 1 Typically between 15-35 staff, as opposed to studios that employ between 100-200 people.